Provide comfort for the family of Carra Wright with a meaningful gesture of sympathy. Mrs. Carra H. Wright was born March 30, 1917 in Wilton, Alabama to the union of Willis and Pauline Heade. She was raised in Selma, Alabama & she later moved to Mobile, Alabama with her husband Clarence Wright, where she was a resident for over 70 years. She departed this life to be with her heavenly father on March 21, 2019 at the age of 101. She was a faithful member of Saint Peter MB Church for over 70 years, where her beloved Reverend Cleveland McFarland, Jr is the Pastor. 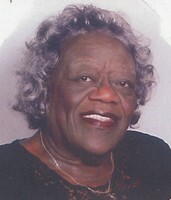 Mrs. Carra H. Wright was an active member of many societies and organizations. She played an active role as a volunteer for the foster grandparents program for over 20 years. She served in various capacities in the church and also with the Mobile Baptist sunlight District Association. She retired from S.H Kress in Prichard, AL. She was preceded in death by her husband; three sisters; three brothers and one stepdaughter. She leaves to cherish her memories a loving daughter: Barbara Chaney; a loving and devoted granddaughter: Erica Chaney; a loving grandson: Francis E.F Chaney; three loving great nieces: Ramona Roberts, Lawanda Heade, Deirdra (William) White; a host of other loving relatives and friends. Her remains will lie in state on Friday, March 29, 2019 from 1pm- 8pm at Small’s Mortuary, Mobile, Alabama. A visitation will be held on Saturday, March 30, 2019 from 9am until the 11am Homegoing Celebration at St. Peter MB Church, 650 S. Bayou St., Mobile, AL. Interment will follow in Pine Crest Cemetery, Mobile, AL. DIGNIFIED AND PROFESSIONAL SERVICES ENTRUSTED TO SMALL’S MORTUARY, 950 SOUTH BROAD STREET, MOBILE, ALABAMA, 36603. To send flowers in memory of Carra Wright, please visit our Heartfelt Sympathies Store. We encourage you to share your most beloved memories of Carra here, so that the family and other loved ones can always see it. You can upload cherished photographs, or share your favorite stories, and can even comment on those shared by others. Provide comfort for the family of Carra Wright by sending flowers. Praying for the family in your time of sorrow.